These are lyrics by Local H that we think are kind of repetitive. 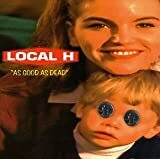 Local H's, "Bound For The Floor"
As much as I like this song, I will have to concede it's pretty redundant. They sing this chorus about 10 or 12 times over the course of the song (which kinda annoys my Mom, LOL). Local H's, "High Fiving MF"